Friday night we held our July Pot Luck Dinner. Thirteen (13) members showed up. Rich, Candy, Connie and Gerry gave us a pleasant surprise by their attendance. It was a small party so we changed the positioning of the tables to face each other. Pres. Tom Carbonell reported on the expected progress of the Nidy court renovations. He explained that we needed to seal the completed courts with wax before playing on them. Joan Best said a dinner prayer before we lined up to chow down. The food was tasty and filling. Tom brought his wonderful pork loin while Jim brought his famous deviled eggs. 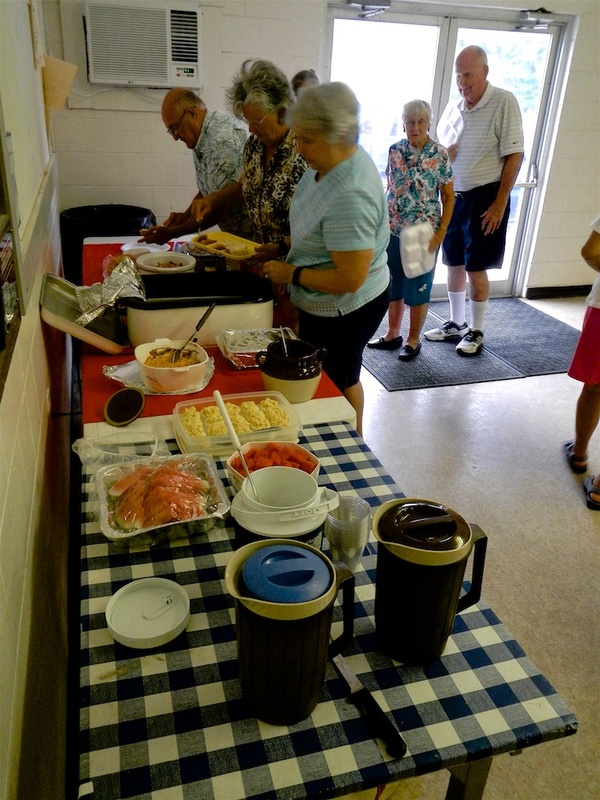 There was ham, chicken, baked beans, broccoli casserole and desserts. We socialized for a time during and after dinner before everyone helped to clean up. We did not have enough members to play Bunco, so we all said goodbye till we meet again. Tom Carbonell stayed after the dinner to squeegee off the upper courts so they would be clean and dry for waxing on Saturday morning.